Phototypesetting is a method of setting type, rendered obsolete with the popularity of the personal computer and desktop publishing software, that uses a photographic process to generate columns of type on a scroll of photographic paper. Typesetters use a machine called a phototypesetter, which quickly projects light through a film negative image of an individual character in a font, through a lens that magnifies or reduces the size of the character onto photographic paper, which is collected on a spool in a light-tight canister. The photographic paper or film is then fed into a processor, a machine that pulls the paper or film strip through two or three baths of chemicals, where it emerges ready for paste-up or film make-up. Phototypesetting machines project characters onto film for offset printing. In 1949 the Photon Corporation in Cambridge, Mass. developed equipment based on the Lumitype of Rene Higonnet and Louis Moyroud. The Lumitype-Photon was first used to set a complete published book in 1953, and for newspaper work in 1954. 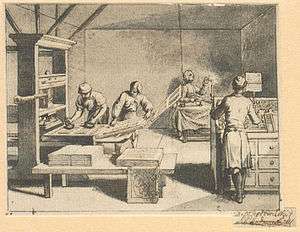 Mergenthaler produced the Linofilm using a different design, and Monotype produced Monophoto. Other companies followed with products that included Alphatype and Varityper. The major advancement presented by the phototypesetting machines over the Linotype machine hot-type machines was the elimination of metal type, an intermediate step no longer required once offset printing became the norm. This cold-type technology could also be used in office environments where hot-metal machines (the Mergenthaler Linotype, the Harris Intertype and the Monotype) could not. The use of phototypesetting grew rapidly in the 1960s when software was developed to convert marked up copy, usually typed on paper tape, to the codes that controlled the phototypesetters. To provide much greater speeds, the Photon Corporation produced the ZIP 200 machine for the MEDLARS project of the National Library of Medicine and Mergenthaler produced the Linotron. The ZIP 200 can produce text at 600 characters per second using high-speed flashes behind plates with images of the characters to be printed. Each character has a separate xenon flash constantly ready to fire. A separate system of optics positions the image on the page. An enormous advance was made by the mid-1960s with the development of equipment that projects the characters from CRT screens. Alphanumeric Corporation (later Autologic) produced the APS series. Rudolf Hell developed the Digiset machine in Germany. The RCA Graphic Systems Division manufactured this in the U.S. as the Videocomp, later marketed by Information International Inc.. Software for operator-controlled hyphenation was a major component of electronic typesetting. Early work on this topic produced paper tape to control hot-metal machines. C. J. Duncan, at the University of Durham in England, was a pioneer. The earliest applications of computer-controlled phototypesetting machines produced the output of the Russian translation programs of Gilbert King at the IBM Research Laboratories, and built-up mathematical formulas and other material in the Cooperative Computing Laboratory of Michael Barnett at MIT. In Europe, the company of Berthold had no experience in developing hot-metal typesetting equipment, but being one of the largest German type foundries, they applied themselves to the transference. Berthold successfully developed its Diatype (1960), Diatronic (1967), and ADS (1977) machines, which led the European high-end typesetting market for decades. Compugraphic produced phototypesetting machines in the 1970s that made it economically feasible for small publications to set their own type with professional quality. One model, the Compugraphic Compuwriter, uses a filmstrip wrapped around a drum that rotates at several hundred revolutions per minute. The filmstrip contains two fonts (a Roman and a bold or a Roman and an Italic) in one point size. To get different-sized fonts, the typesetter loads a different font strip or uses a 2x magnifying lens built into the machine, which doubles the size of font. The CompuWriter II automated the lens switch and let the operator use multiple settings. Other manufacturers of photo compositing machines include Alphatype, Varityper, Mergenthaler, Autologic, Berthold, Dymo, Harris (formerly Linotype's competitor "Intertype"), Monotype, Star/Photon, Graphic Systems Inc., Hell AG, MGD Graphic Systems, and American Type Founders. Released in 1975, the Compuwriter IV holds two filmstrips, each holding four fonts (usually Roman, Italic, bold, and bold Italic). It also has a lens turret which has eight lenses giving different point sizes from the font, generally 8 or 12 sizes, depending on the model. Low-end models offer sizes from 6- to 36-point, while the high-end models go to 72-point. The Compugraphic EditWriter series took the Compuwriter IV configuration and added floppy disk storage on an 8-inch, 320 KB disk. This allows the typesetter to make changes and corrections without rekeying. A CRT screen lets the user view typesetting codes and text. Because early generations of phototypesetters cant't change text size and font easily, many composing rooms and print shops had special machines designed to set display type or headlines. One such model is the PhotoTypositor, manufactured by Visual Graphics Corporation, which lets the user position each letter visually and thus retain complete control over kerning. Compugraphic's model 7200 uses the "strobe-through-a-filmstrip-through-a-lens" technology to expose letters and characters onto a thin strip of phototypesetting paper that is then developed by a photo processor. Some later phototypesetters utilize a CRT to project the image of letters onto the photographic paper. This creates a sharper image, adds some flexibility in manipulating the type, and creates the ability to offer a continuous range of point sizes by eliminating film media and lenses. 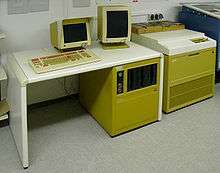 The Compugraphic MCS (Modular Composition System) with the 8400 typesetter is an example of a CRT phototypesetter. This machine loads digital fonts into memory from an 8-inch floppy disk. Additionally, the 8400 is able to set type-in point sizes between 5- and 120-point in 1/2-point increments. 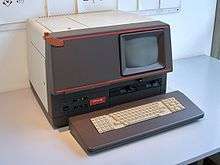 It is extremely fast and was one of the first output systems (the other was also a Compugraphic machine, the 8600) that is able to create camera-ready output with a maximum width of 12 inches. As phototypesetting machines matured as a technology in the 1970s, more efficient methods were found for creating and subsequently editing text intended for the printed page. Previously, hot-metal typesetting equipment had incorporated a built-in keyboard, such that the machine operator would create both the original text and the medium (lead type slugs) that would create the printed page. Subsequent editing of this copy required that the entire process be repeated. The operator would re-keyboard some or all of the original text, incorporating the corrections and new material into the original draft. CRT-based editing terminals, which can work compatibly with a variety of phototypesetting machines, were a major technical innovation in this regard. Keyboarding the original text on a CRT screen, with easy-to-use editing commands, is faster than keyboarding on a Linotype machine. Storing the text magnetically for easy retrieval and subsequent editing also saves time. An early developer of CRT-based editing terminals for photocomposition machines was Omnitext of Ann Arbor, Michigan. These CRT phototypesetting terminals were sold under the Singer brand name during the 1970s. Early machines have no text storage capability; some machines only display 32 characters in uppercase on a small LED screen and spell-checking is not available. Proofing typeset galleys is an important step after developing the photo paper. Corrections can be made by typesetting a word or line of type and by waxing the back of the galleys, and corrections can be cut out with a razor blade and pasted on top of any mistakes. Since most early phototypesetting machines can only create one column of type at a time, long galleys of type were pasted onto layout boards in order to create a full page of text for magazines and newsletters. Paste-up artists played an important role in creating production art. Later phototypesetters have multiple column features that allow the typesetter to save paste-up time. Early electronic typesetting programs were designed to drive phototypesetters, most notably the Graphic Systems CAT phototypesetter that troff was designed to provide input for. Though such programs still exist, their output is no longer targeted at any specific form of hardware. Some companies, such as TeleTypesetting Co. created software and hardware interfaces between personal computers like the Apple II and IBM PS/2 and phototypesetting machines which provided computers equipped with it the capability to connect to phototypesetting machines. With the start of desktop publishing software, Trout Computing in California introduced VepSet, which allows Xerox Ventura Publisher to be used as a front end and wrote a Compugraphic MCS disk with typesetting codes to reproduce the page layout. In retrospect, cold type paved the way for the vast range of modern digital fonts, with the lighter weight of equipment allowing far larger families than had been possible with metal type. However, modern designers have noted that compromises of cold type, such as altered designs, made the transition to digital when a better path might have been to return to the traditions of metal type. Adrian Frutiger, who in his early career redesigned many fonts for phototype, noted that "the fonts [I redrew] don’t have any historical worth...to think of the sort of aberrations I had to produce in order to see a good result on Lumitype! V and W needed huge crotches in order to stay open. I nearly had to introduce serifs in order to prevent rounded-off corners – instead of a sans-serif the drafts were a bunch of misshapen sausages!" ↑ Michael P. Barnett, Computer typesetting, experiments and prospects, 245p, MIT Press, Cambridge, Mass, 1965. ↑ Arthur Phillips, Computer peripherals and typesetting: a study of man-machine interface incorporating a survey of computer peripherals and typographic composing equipment, HMSO, 1958, London. ↑ Jack Belzer, Albert G. Holzman and Allen Kent, Encyclopedia of computer science and technology, 267- (over 100 pages) . ↑ John. Pierson, Computer composition using PAGE-1, Wiley Interscience, New York, 1972. ↑ The Ann Arbor News 6 April 1973 "Singer Corp. has completed negotiations with Omnitext, Inc."
↑ Joseph Condon; Brian Kernighan; Ken Thompson (January 6, 1980). "Experience with the Mergenthaler Linotron 202 Phototypesetter, or, How We Spent Our Summer Vacation" (PDF). Bell Laboratories. ↑ Frutiger, Adrian. Typefaces - the complete works. p. 80. ISBN 3038212601. "Phototypositor". Archived from the original on 2013-02-07. Retrieved 2015-11-30. "Typesetting and Paste-Up, 1970s Style"